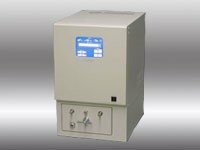 The chemiluminescence (CL) analyzer allows the analysis of the oxidation behavior of polymers and organic materials under the influence of different gases and temperatures. Main focus of the analysis are factors like initial oxidation level or determination of the oxidation induction time (OIT) and temperature (OOT). "Chemiluminescence"(chemical luminescence) is the phenomenon arising from chemical reactions. Compounds generated in an excited state by chemical reactions, released to the ground state, discharge light. 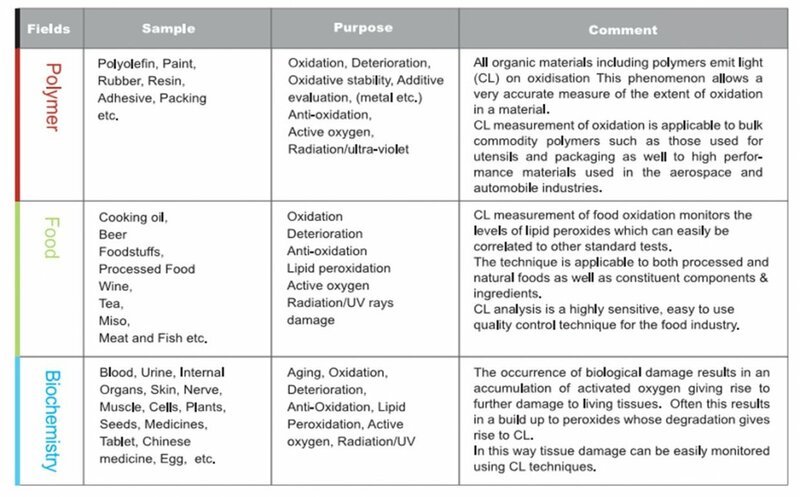 Exposed to the atmosphere almost all materials generate chemiluminescence as a result of oxidation reactions. The Chemiluminescence Analyzer (CLA series) is the most sensitive photon counting device and the only spectrometer with that sensitivity in the world. It detect down to 50 photons/cm2/sec (about 1/10000 of a firefly) 10-15 Watts. To use Photomultiplier (PMT) as a detector and most high sensitive detector. You can measure CL intensity only. Batch Type sample chamber to use Maximum φ20mm sample. Possible to room temp. to 350 degree and set the heating rate. Batch Type sample chamber to use Maximum φ50mm sample. Possible to room temp. to 160 degree. Batch Type sample chamber to use Maximum φ50mm sample. Possible to room temp. to 100 degree and mixing the sample with Stirring bar. Flow type sample chamber. It consists 2 inlet ports for sample liquid and mix inside. The mixed sample come out from 1 outlet port. This is for CLA-IMG. You can set 6 samples of maximum φ20mm. Possible to room temp. to 160 degree. Installed Laser Diode to irradiate the Laser light to the sample. The laser power is about 0.2mW.